“Any sufficiently advanced technology is indistinguishable from magic” – Arthur C. Clarke. Fantasy and science fiction are two popular genres which closely overlap – at least from a lay perspective. They share many elements yet nurture loyal groups of readers who sometimes refuse to enter the opposing camp. So are they that different? Both genres of writing fall under the umbrella of speculative fiction, operating on their own carefully thought-out inner logic, using invented worlds as a metaphor for our own, or exploring some sort of utopian ideal. They tend to conform to archetypal characterisation of hero, heroine, villain, sidekick, etc. Wikipedia says of science fiction: “its imaginary elements are largely possible within scientifically established or scientifically postulated laws of nature”; and it is often set in the future. Fantasy, according to the same source, “commonly uses magic and other supernatural phenomena as a primary plot element, theme, or setting”. Fantasy should still use such elements rationally in a structural sense; otherwise the reader’s belief will falter. While fantasy revels in the use of unscientific and unexplained powers or “magic”, science fiction takes pains to describe the nuts and bolts behind the fantastic. The difference seems to be in the degree to which the author attempts to justify such elements. One seems to tweak our emotional strings, and the other, our intellectual ones. So there may be a subtle right-brain/left-brain divergence between fantasy and science fiction readers, though most of us, myself included, enjoy reading both genres. The Bulgarian academic Tzvetan Todorov coined terms like “the fantastic”, “the fantastic uncanny” and “the fantastic marvellous” to describe how Medievalist fantasy – set in a pseudo-Medieval society – explores political, historical and literary links between Medievalism and popular culture. The responsibility falls on us readers to choose whether an event must be: a) dreamed or imaginary (“the fantastic uncanny”); b) real but implausible, implying a modification to our understanding of reality (“the fantastic marvellous”); or c), purely fantastic, meaning that the event is neither of an imagined cause like a dream or madness, nor unlikely though real. Can books cross these genres? 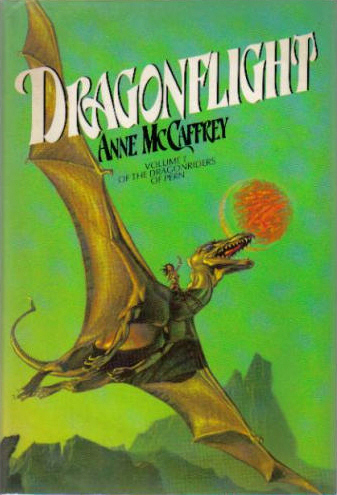 Anne McCaffrey’s “Dragonriders of Pern” series appears to, conjuring up a world of dragons that communicate telepathically with their human riders. The stories are Medievalist, of the kind favoured by much Eurocentric fantasy writing since Tolkien. Yet scientific explanations are uncovered concerning the founding of Pern and everything within it. It turns out that these “dragons” are a species that was genetically manipulated by Pern’s early human settlers as a defence against the alien “thread” that invades the planet periodically. So, however fantastic, little or no actual magic appears. Fantasy seems to hark back to a golden romantic past, an age of chivalry and pure ideals, while science fiction uses similar scenarios to speculate on the future. In the Pern books, the rationally explained, technological future turns out to form part of a golden past. Both fantasy and science fiction provide a metaphor on the real world. When I started to write “The Jewel Fish Chronicles”, I wanted to straddle two genres, fantasy and realism, and tried to apply a certain scientific craft to the use of magic. I aimed to move from fantasy towards reality as opposed to the simple escapism of so much fantasy writing. Yet now having considered this question, I wonder whether the “supernatural phenomena” I introduce, such as crossing the frontier between life and death, and the water “magic” wielded by the Shahee sea nomads are not rather unexplained “science”, which Jade and other characters are simply not advanced enough to understand? If so, I am really writing science fiction. I think I’ll wait and see what the characters reveal. This entry was posted in fantasy, science fiction, speculative fiction and tagged Anne McCaffrey, Arthur C. Clarke, fantasy, genre, literature, science fiction, science fiction readers, The Jewel Fish Chronicles by Kevin Booth. Bookmark the permalink.